Leicester (G-B) : One foot from the grave! 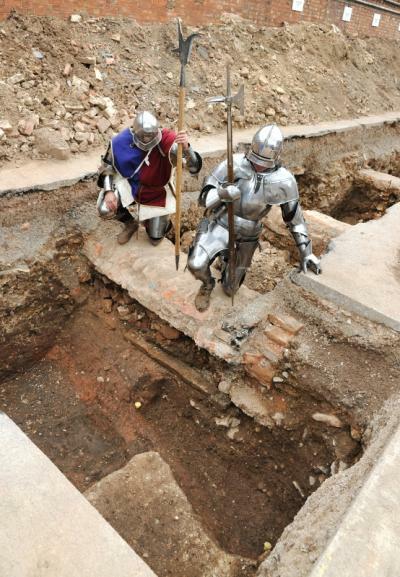 Archaeologists from the University of Leicester who uncovered a grave thought to contain the skeleton of King Richard III have revealed that the remains came within inches of being destroyed by Victorian builders. The University of Leicester led the search for the Anointed King who died at the battle of Bosworth in association with Leicester City Council and the Richard III Society. The University team dug three trenches under a Leicester car park before their discovery was made. Mathew said: "It was incredibly lucky. If the Victorians had dug down 30cm more they would have built on top of the remains and destroyed them." City Mayor Sir Peter Soulsby added: "It is extremely lucky that the remains were found at all. "His head was discovered inches from the foundations of a Victorian building. They obviously did not discover anything and probably would not have been aware of the importance of the site. "If their plans had been just a little different, they could have destroyed a most significant historic find." Using DNA extracted from Michael Ibsen, believed to be a descendant of King Richard III's sister, the team will seek to determine if there is a match. The entire dig was filmed by Darlow Smithson Productions for a Channel 4 Documentary.